Plant a tree in memory of Gary "Butch"
Be the first to share your favorite memory, photo or story of Gary "Butch". This memorial page is dedicated for family, friends and future generations to celebrate the life of their loved one. Gary “Butch” Hayes, 76, passed away at Booker Rest in Dayton, Washington on November 27, 2018. A Graveside Inurnment will be Saturday, December 8th at 1:00pm at the Ivy Cemetery in Prescott, Washington with a potluck to follow at the Prescott Lions Club. Butch loved old cars and they were his passion, he ate, slept, and breathed cars. 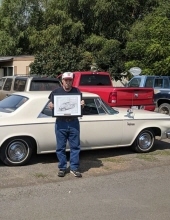 He attended car shows all over Oregon and Washington. Butch was a simple man who was loved by his family and his pet cats. He was a well established Prescott local who was known by many and he will be missed. Butch is survived by his son, William “Bill” Hayes, grandson, Cody Michael Hayes, and Ben Gloor. He is preceded in death by his parents, sister, Peggy Hanson, brother, Ricky Hayes, grandson, Kyle Dillon Hayes and his significant other Cora Lee Gloor. To plant a tree in memory of Gary "Butch" Walter Hayes, please visit our Tribute Store. "Email Address" would like to share the life celebration of Gary "Butch" Walter Hayes. Click on the "link" to go to share a favorite memory or leave a condolence message for the family.